For the 24 hours to 23:00 GMT, the AUD rose 0.59% against the USD and closed at 0.7101. LME Copper prices declined 1.39% or $124.0/MT to $6136.0/MT. Aluminium prices declined 1.4% or $28.5/MT to $1952.0/MT. In the Asian session, at GMT0400, the pair is trading at 0.7085, with the AUD trading 0.23% lower against the USD from yesterday’s close. Earlier today, in Australia, the consumer price index (CPI) rose 1.9% on a yearly basis in 3Q18, in line with market expectations. The CPI had advanced 2.1% in the prior quarter. Additionally, private sector credit climbed 0.4% on a monthly basis in September, meeting market expectations. In the prior month, private sector credit had registered a rise of 0.5%. Elsewhere, in China, Australia’s largest trading partner, the NBS manufacturing PMI dropped to 50.2 in October, more than market expectations. The NBS manufacturing PMI had recorded a level of 50.8 in the prior month. 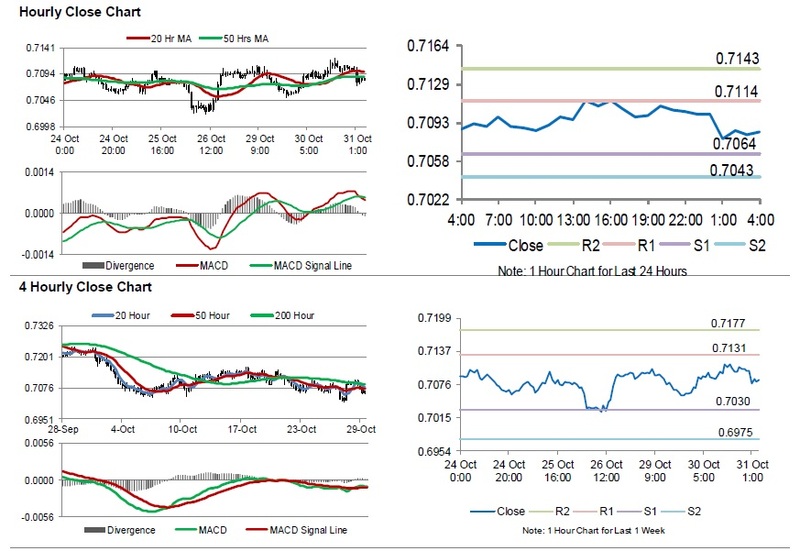 The pair is expected to find support at 0.7064, and a fall through could take it to the next support level of 0.7043. The pair is expected to find its first resistance at 0.7114, and a rise through could take it to the next resistance level of 0.7143. Trading trend in the Aussie today is expected to be determined by Australia’s AiG performance of manufacturing index and the CBA manufacturing PMI, both for October, slated to release overnight.